Are you a fan of trains? Are you interested in model trains? Join the Kingsport Train Club! The Kingsport Train Club meets Tuesday evenings from 6:30 to 8:30 p.m. The club meets at Innovation Forge (the old YMCA building) at 1100 Franklin Square, beside Chop House on Eastman Road. The club is open to all in the community and will feature O gauge MTH trains which were graciously donated to the club by the Ned McChrystal Family. In addition, HO and N gauge trains will also be available. The club is sponsored by Engage Kingsport. For more information, please contact Dave Stevens at dstevens@kptware.com or (423) 967-1173. William, son of Russ Ayscue, shows a completed small train layout. 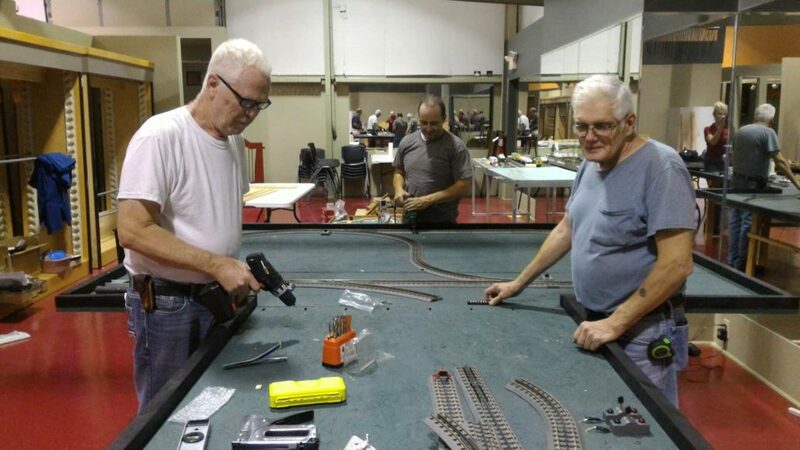 Richard Woelkers, Russ Ayscue, and Robert Myers build a foundation for a larger train layout.